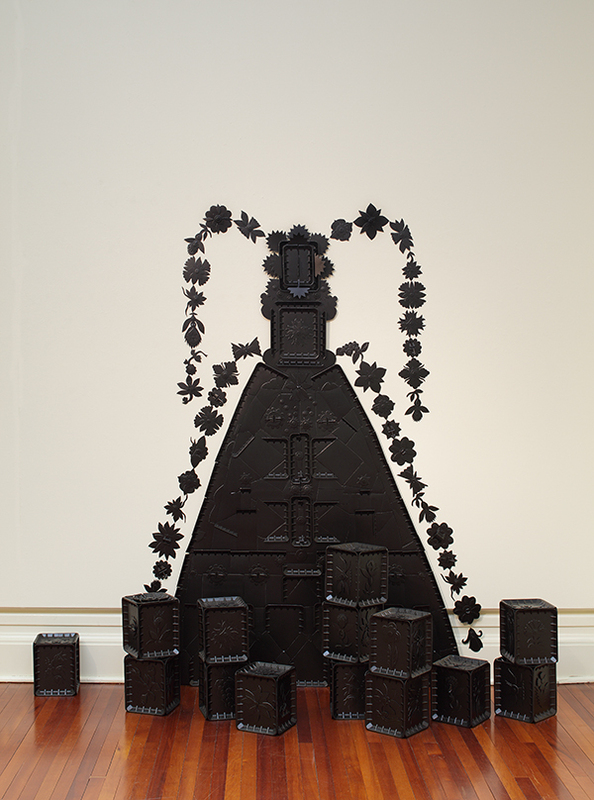 Andrea Gardner ‘Rosette’ 2003, black plastic meat-trays, 2005/15/1. Collection of the Sarjeant Gallery, Te Whare O Rehua, Whanganui. Gift of the artist, 2005. Spring is blooming at the Sarjeant Gallery with an exhibition, Bloom: Floral Works from the Collection that celebrates the season. Paintings, ceramics and even jewellery bedeck the gallery walls and floor space, and there are some unusual works that attest to the diversity of our creative response to the natural world. Adjacent to Edith Collier and Harry Richardson’s portraits of young girls, glowing with the promise of youth against a backdrop of flowers, Andrea Gardner’s black, environmentally acute Rosette (pictured) stands out, both because of its unspring-like colour and the opposites it embodies. The installation resembles a Minoan goddess form, or a fountain of flowers made from recycled Styrofoam meat trays. Unlike real flowers that bloom, wither and die these will never biodegrade. So this strangely beautiful work, created out of trash, both attracts and repels, while stimulating reflection. The Rick Rudd ceramic box collection presents small boxes of different forms and techniques decorated with floral motifs. One of the curator’s favourites is the quirky “Princess Box” by Ann Verdcourt of a princess with big hair in a big dress. “Her hands and face are obscured in her hair – she’s quite overwhelmed by it.” On the back an inscription declares, “A princess that everyone knows. In these frocks I look just like a box. Sprinkled with feathers and bows.” The piece references 18th century Rococo dresses with large panniers. Skirts could be as wide as 4.5 meters, obliging women to go sideways through doors. On the weekend of the 5-6 November the Sarjeant is holding a spring weekend festival in the Gallery. The public is invited to take part in art making and to attend talks and demonstrations by floral artists and gardeners, tours of the exhibition and entertainment. This story was first published in the Wanganui Chronicle on 18 October, 2016.